Joshua Marshman's early life was rather nondescript, and he, like his father, was a weaver in Westbury Leigh, Wiltshire, England. Eventually, he enrolled at Bristol Academy where he studied and advanced himself in Latin, Greek, Hebrew, and Syriac. Through the Periodical Accounts of the Baptist Missionary Society, Marshman learned about William Carey's work in India, and volunteered to join him. Marshman, along with his wife Hannah, William Ward, Mr. Brundson, Mr. Grant, and joined William Carey in Serampore on October 13, 1799. Mr. Grant died eighteen days later, Mr. Brundson died in 1801, and Ward died from cholera in 1823. Carey's death followed in 1834 as did Hannah Marshman's in 1847 (Obituary and Portrait). Some of the Marshmans' work included opening and operating schools for English children and native Indians. 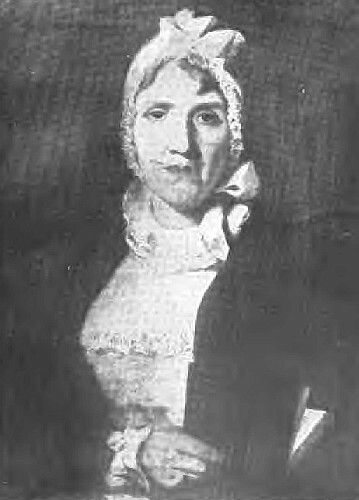 He and his wife Hannah devoted themselves to this work, and the Marshmans reinvested monies earned from this activity into the Serampore Mission. 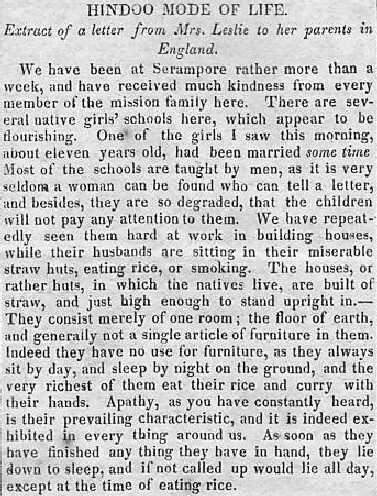 Hannah became known for her work in starting schools for Bengali children (including females) in Serampore. On April 9, 1825, the Christian Register, an American newspaper, reported the establishment and operation of these schools. Arriving in India in 1799 and dying in Serampore in 1847, Hannah served as a Baptist missionary there longer (48 years) than anyone else directly associated with the Serampore Trio. Being committed to the education of children, Marshman published a juvenile book for the religious instruction of children. The Religious Tract Society of London published the thirty-six page pamphlet. To read this pamphlet, click on the following link: School Dialogues; or, Lessons on the Commandments and the Way of Salvation. To Which is Added A Dialogue on Reading (London: The Religious Tract Society, n.d. [1821?]). Joshua Marshman was an accomplished scholar, linguist, and theologian and was a prolific author and polemicist. After learning Bengali and Sanskrit, Carey and Marshman published—through the Serampore Press—the Bengali form of The Ramayuna of Valmeeki (vol. I, 1806; vol. 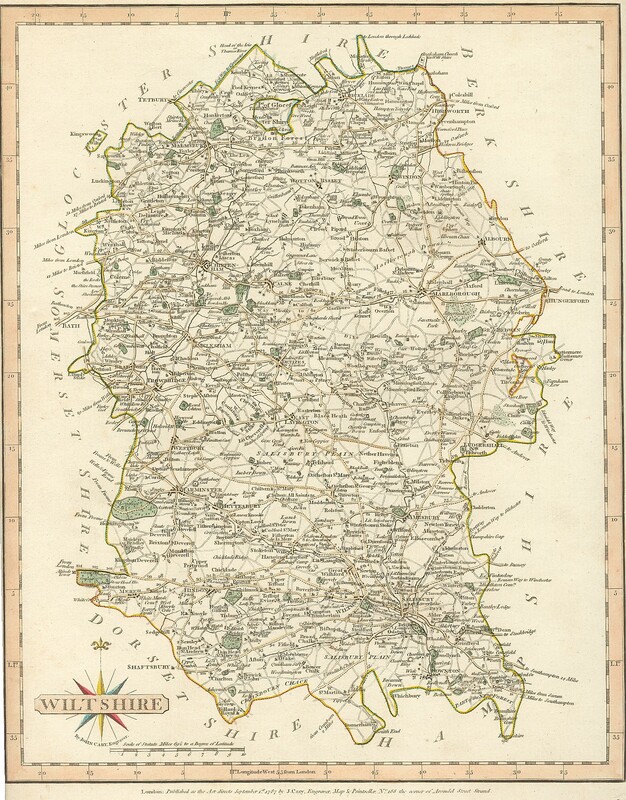 II, 1808), which Ward would have seen to completion. Marshman also has the honor of being the first to have translated the Bible into Chinese. In 1821, the Serampore Press published the first translation of the Bible into Chinese, the work on which Marshman had spent fifteen years. Marshman also published A Dissertation on the Characters and Sounds of the Chinese Language (1809), a translation of Confucius (1809), and Clavis Sinica (1814). In 1818, Marshman started a Bengali newspaper Sumachar-Durpan (i.e., Mirror of News) as well as the monthly magazine Friend of India. Significantly, Carey, Marshman, and Ward established Serampore College in 1818. In 1811, Brown University, Providence, Rhode Island, awarded Marshman an honorary Doctor of Divinity degree. Previously in 1806, Brown had awarded William Carey the same degree. In the early 1820s, Marshman engaged in a polemical debate with Rammohum Roy concerning the deity of Jesus and the Christian doctrines of the atonement and the Trinity. The debate focused on Roy's Unitarianism, which Marshman and the other Serampore missionaries strongly disagreed. Marshman wrote an extended monograph on the subject entitled A Defence of the Deity and Atonement of Jesus Christ, In Reply to Ram-Mohun Roy of Calcutta (London: Kingsbury, Parbury, and Allen, 1822). Carey, Marshman, and Ward worked cooperatively, and came to have the name "the Serampore Trio." Marshman's son, John Clark Marshman (an eminent journalist and historian), wrote a definitive treatment of the Serampore Trio (The Life and Times of Carey, Marshman, and Ward Embracing the History of the Serampore Mission, 2 vols., London: Longman, Brown, Green, Longmans & Roberts, 1859). In addition, Joshua Marshman published at least one "Christian Hymn" (see Rev. 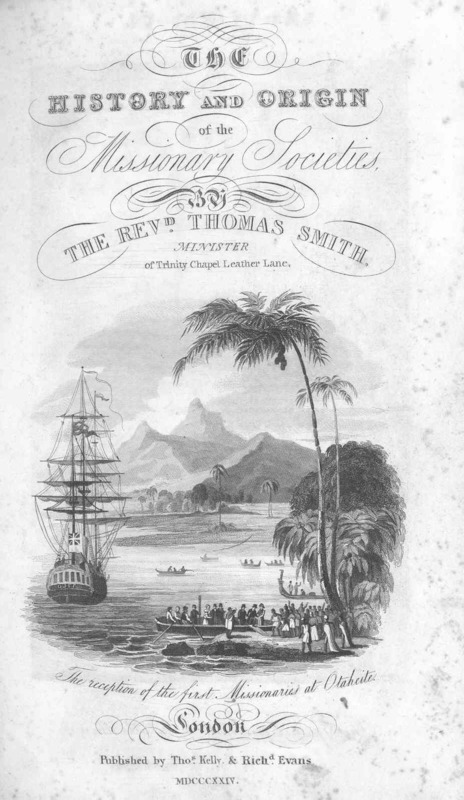 Thomas Smith, The History and Origin of the Missionary Societies, vol. 1, London: Thos. Kelly and Richd. Evans, 1824), 376-377). He died in Serampore on December 5, 1837, and was buried in the mission burial ground there the next day. 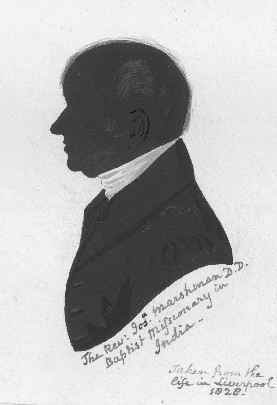 John Fenwick, "Biographical Sketch of Joshua Marshman, D.D., of Serampore." Newcastle Chronicle. Newcastle Upon Tyne: Emerson Charnley, 1843. In 1843 on the occasion of the Jubilee of the Baptist Missionary Society, Fenwick published a recognition essay about the BMS to which he attached both of the above biographies. Click here to view this essay followed by the the two obituaries linked above. "The Reverend Joshua Marshman, D.D." The Bengal Obituary. 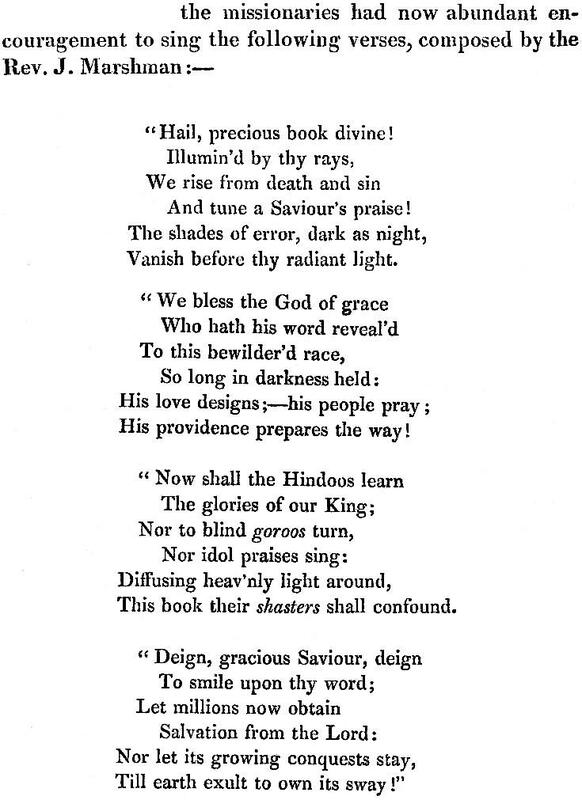 Calcutta: J. Thomas, Baptist Mission Press, 1848. Pp. 340-343.